I have a hair do that I made in Carrara that I really like. The problem I've been having is in animating it. I've used a proxy figure to help with the vertex counts. The problem seems to belong to the shader. When I remove the frizz, it seems to animate smoothly. But with the frizz applied, it looks a bit 'electric' as it spazzes from one frame to the next. I wonder if it's possible to keyframe drapes at various points - rather than using "Simulate Hair"? Or perhaps I'll try converting to another modeller and making it conforming? Are you using Clumping at all? Coverting to vertex model leaves you with nothing - just gone. Probably hair is more of a special effect than anything else. Are you using Clumping at all?Yeah. 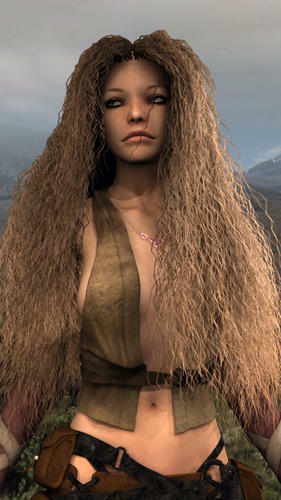 I don't have a Frizz or Wave shader. Do you animate with Dynamic hair much, Holly? Maybe a stiffer shape would help? I've tried a couple hair animations, but my system is getting long in the tooth and I don't have the patience. I tried a number of experiments with just a ball... it doesn't look like "frizz" is animation-friendly: whatever random function they use is a bit too random. I was able to produce several variations on ugly, but nothing useful. this can be conformed to Genesis using transfer tool saved as an asset .duf file and will import as a Genesis hair item or imported into Carrara as an obj selected along with the hip of any figure and in animation tab attach skeleton, weightpaint if needed. not as good as Carrara hair, no collision for styling and brushing and no draping but that might be coming soon. I myself have been using it to create furry clothes for Genesis figures in iClone but it is very highpoly. I really like this hair - and am hoping to get it to work. Hi Dartanbeck - I really hope you get the hair to work. hair is set to not collide with the cap. If you want it to follow her body for simple movements, try increasing the Air Damping to 75%. up your simulation quality back to 100%. I hope it will work for your long hair. Here is a quick video that demonstrates the difference between Air Damping of 20% and 75%. Wonderful input, indeed! Thanks Man! vibrations, but if I changed it to 24 segments, the vibrations stopped. Cool info. Thanks a bazillion! Keep this up and I'll buy all of your products again! Following your advice, without making any other changes, it turned out much better. I forgot that I had it set with a hair count of only 4,000, which may be why I set it at Very Large for thickness, which I actually kind of like. But it does get a bit Rag-Doll looking close up. I really like this hair. Just knowing that others are getting good results was enough for me to continue on and make it work. It's been sitting in my browser all Summer, perhaps longer. I just thought it wouldn't work. For stills, I think it's the best hair (Carrara hair, in general) I've ever seen. 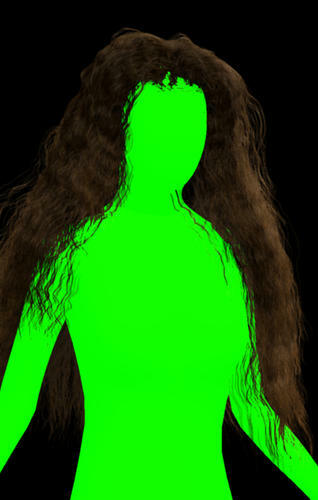 I wish I could get away with making a conforming hair that worked like this - instead of being so heavy with alpha maps. However, I think this may take just as long to render. When I watch it render a still, it seems to be faster by a margin. Animations seem to be where it really chews time. Really cool. Glad to see you got it working. It got a little better. I'm noticing, however, that everybody else, who's getting good results, are using a much much higher hair count - so that's my next step. Its getting so much better that I may just have to plan on the switch, from here out - a new Rosie. It's been a while... maybe I'll work a little more on all of her. Get her ready for production. Much higher hair count, slightly more gravity, and 50% Air friction. I forgot to turn a bunch of stuff back on for the above render. I like the texture of the hair itself much better in the previous image at the top of the page. We'll see how it looks tomorrow. I really like this one - the hair looks much more real now - nice work! Have to give up for now. Can't get the twitching to stop during animation renders no matter what I try. Maybe next time I can waste a week waiting for renders I'll try again using different shader settings altogether. The bummer with that is that it took forever to get just that right look that I wanted. Too bad. It animated great before, when I took away the curls. Frizz is just unfriendly. I need to update my notes on hair to reflect this, but frizz -- even without animation -- very quickly goes into some weird state where the hair (or some strands of it) are scaled to extreme size (except for diameter). The result is a hash of apparently random lines across the scene with all segments at significant angles. I haven't done enough cross checking to be sure of the whys and wherefores, but I suspect it is an issue with too many segments (too many strands or just too high of a segment count). I've had this issue as well. Come to think of it, it may have been with a high hair/guide hair segment count. As I have come to expect that it is the shader itself that is causing the jitter, or perhaps the combination of that and that the hair is so long, I am going to try this method. I am currently using PhilW's Proxy Figure. Not the one that you conform to V4, but a stand-alone proxy model that you animate. I'm leaving the scene empty of everything for now, put a glowing green shader on the proxy model, and am filming the animation with an alpha channel into a sequence of Targa images. My hero character has a different scale than the proxy. So if this works okay, I'll have to make my own poxy, or just edit this one. If it doesn't work out okay, I'll try the same effect, but with primitive spheres in place of the proxy figure. Howler accepts sequenced Targa as either an animated brush, or a green screen (or many other composite types) in the swap channel. So I intend to remove the worst jitters in the hair animation by deleting frames evenly throughout the animation sequence, and then use the motion prediction module to tween differences between the remaining frames to get the sequence back to the original length, which I'm hoping will both remove the sporadic behavior, as well as keep the full motion that the physics engine is providing. Copy that sequence over to Swap and add a new sequence of the hairless hero, which uses the same camera, and is scaled to fit the hair placement. Then combine with swap using green screen. If this works as easy as I just made it sound, I will actually save render time by doing it this way but also get the added benefit of the beauty of Carrara's dynamic hair. As you can see, this test is being done with a very low fidelity hair of only 7,000 hairs. I just need to know if the method will work. If it does, the hair will get made much nicer, and I'll put all of the advice given in this thread to the simulation. EDIT: Also, I don't recall if the alpha can be respected in Swap. If not, the brush keyframer will, which may be the best route for this anyways, as it gives full visual control and the ability to make keyframed alterations. Maybe a shadow catcher instead of green screen and rendered with an alpha channel should also work. May prevent some color spill between strands and it should act as a mask for those hairs behind the figure. I was wondering about that... so that might just make the area where the shadow catch is as alpha?